You don’t have to be the next Alicia Keys to play piano in front of a crowd in Boston this fall. Thanks to Play Me, I’m Yours, an installation by UK artist Luke Jerram, 60 pianos have been placed on the street in every Boston neighborhood and some locations in Cambridge. The mission? To give the people of Boston an open opportunity to play music for everyone’s enjoyment. The Celebrity Series of Boston has brought the installation to our city’s streets. 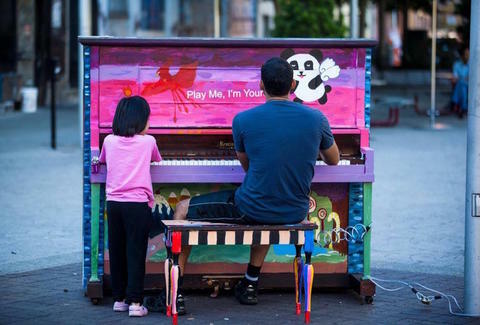 Local artists were selected to decorate a piano each, so the instruments have become not only vehicles for musical expression, but a public display of free, accessible original artwork throughout the city. Both the locations of the piano and the artists who were chosen to enhance them were intended to speak towards the spirit of Boston. Ben Kauffman, an artist and master’s candidate at New York University, grew up in Boston and designed a piano that will sit in the Berklee College of Music Bookstore, ready for music students to practice for an exam, or to just show off for their friends. Harvard Ed Portal in Allston is a place that fosters educational, arts, and wellness opportunities for the Allston-Brighton community, and to extend their mission, they have welcomed a piano designed by local artist Christine Winship that will be accessible to its patrons. Some artists were attracted to the project after seeing it the first time it came to town in 2013. “I fell in love with the entire idea,” said artist Sarah Iwany, who painted a piano for this fall’s installation, said on the Celebrity Series of Boston Facebook page. “The combination of art, music, and community is brilliant." Local artist and teacher Brian Reddy painted a piano that will be available in Statler Park, near the Theatre District. "I wanted to create something that was based on color and texture, exploring opposites -- old and new, contemporary and traditional... so when I found out that I was going to be painting a piano, which is wooden and temporary, I chose to make it look old, permanent, and weathered," Brian said. 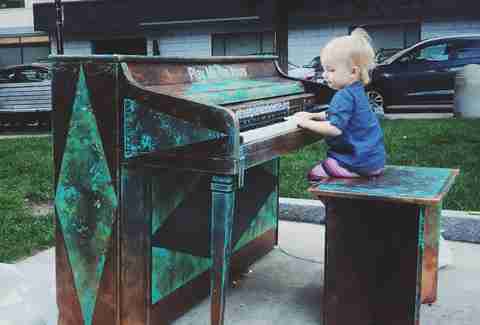 "I painted the piano to look like a bronze or copper statue that has a patina or verdigris on it. Boston has a lot of statues, and objects take on a kind of life when they get a patina. Thinking about all the layers of tradition Boston has, and the diversity available in this small city, I wanted to embrace the city’s contradictory nature. Rather than making the piano bright and beautiful, I was trying to make it beautiful through making it kind of grungy, and embracing all the aspects of the city that way." This piano will also be gaining an extra element. Around lunchtime on Tuesday or Wednesday (weather depending), one of the Boston Ballet’s pianists will be playing selections from Le Corsaire, the company’s season opener, on Brian’s piano. And of course, several ballerinas will be performing alongside -- in costume, no less. "Street Pianos Boston is an extraordinary, interactive public art experience that has the potential to impact hundreds of thousands of Boston resident and visitors," Boston’s Chief of Arts and Culture Julie Burros said in a statement. "Street Pianos gives us an opportunity to celebrate and showcase creativity in our city and will engage people across every neighborhood." 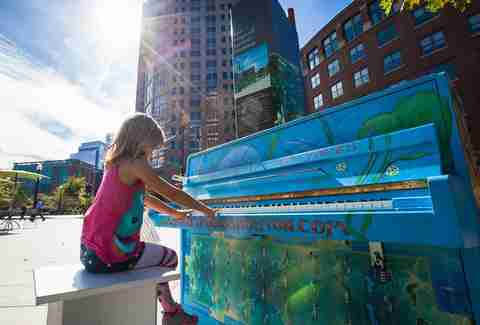 The Play Me, I’m Yours installation last came to Boston in 2013, and more than 500,000 people got the chance to tickle the ivories. The pianos will only be on display from September 23rd to October 10th, so don’t miss your chance to show Boston all of your (real or pretend) musical talents. And if you want to check out some folks with bona fide talent, stop by the piano outside the Boston Center for the Arts on Saturday, September 24th, when the SpeakEasy Stage Company will be performing from 12 to 2pm. Ciera Velarde is an editorial production assistant at Thrillist who can only play "Twinkle Twinkle Little Star" on the piano. Follow her on Instagram.